I guess a lot of people, if they think about classic sixties British roadsters, instantly recall the MGB or Midget models from MG - but for me, the really iconic roadster of the time was the impossibly pretty little Lotus Elan. That probably has a lot to do with the fact that the Elan is forever fixed in my mind with the image of the delicious Diana Rigg, who's character, Mrs Emma Peel, drove a Lotus Elan in the TV series "The Avengers". And like Mrs Peel, the Elan was not just a pretty face - delivering a devastating kick from it's 1600cc twin cam engine that rocketed the little roadster to 60mph in under 8 seconds and on to a top speed of around 120mph. Not bad for 1962. The Elan was produced between 1962 and 1973 (1975 for the +2 version). 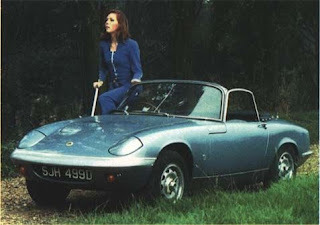 Fast, agile and utterly gorgeous - Mrs Peel and the Elan were a perfect match.